Often when difficult people are confronted for bad behavior it’s easier for them to run somewhere else than stay and work it out. I love it when the circle of restoration that began with confronting sin, and then leads to repentance and confession is completed in reconciliation. Sadly, I’ve not seen it often. I remember in a church I pastored, the leadership warned a divisive man to stop organization a secret petition against the elders and step down from teaching his popular Sunday school class. Remarkably, he did, and a year latter, in humility, he resumed his teaching and served many years as a model of what happens when peacemaking is allowed to run its course. That is where peacemaking really works. Ken Sande is the founder and director of Relational Wisdom 360. Pictured in his home office Tuesday, January 6, 2015. Our guest today, Ken Sande, is going to talk about how the gospel is the motive, the model and the method for reconciliation. Ken Sande is the founder of Peacemaker Ministries and president of a new ministry, Relational Wisdom 360. Trained as a mechanical engineer and lawyer, Ken is passionate about bringing the life-changing power of the gospel into the lives of Christians and their churches. He has used biblical peacemaking principles to minister to parties in hundreds of conflicts, ranging from simple personal disputes to complex legal conflicts. 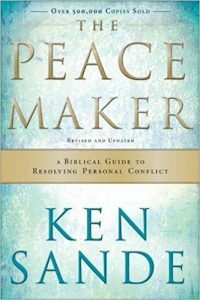 He is the author of “The Peacemaker”, which has been translated into 15 languages, and has written numerous books, articles, and training resources on biblical conflict resolution and relational wisdom. 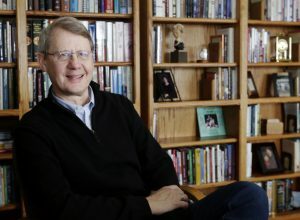 He is a certified Christian conciliator, an editorial advisor for Christianity Today International’s church management team, and a certified emotional intelligence instructor. He and his wife, Corlette, are delighted to be grandparents and love to hike with their family in the mountains near their home in Montana. Previous Previous post: A Blog: Stop Worshipping and Get Right With Your Brother!